I have been thinking a lot about being present lately. This is what I think about throughout the day...while driving especially: If we believe that God is omnipotent (which I do), and omniscient - possessiving unlimited and infinite knowledge, then we can conclude that God is present right now. Like, right this moment. And it's not just a one-way street. If God is present right now...then WE are also in God's presence. All the time. So am I doing my best to be present in front of God? I think about my days: home, work, errands, home, dinner, dishes, running here and there. How present can I be when I'm so harried and rushed. I need to take time to deliberately s-l-o-w d-o-w-n....and be present. And then, if we believe that God is Love (which I do). Then Love is omnipotent and omniscient. Love conquers all. This explains "Good will always prevail over evil". Because if God is Love; Love is omnipotent and infinite. Therefore, good will always prevail because evil is finite. Am I doing my best to convey God's love to others - always? Am I present in Love? This is something that I'll continue to work on. Conveying love through action. When Has it Ever Not Been Crazy? 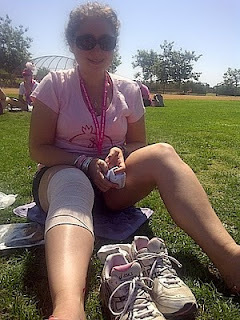 With the Avon Walk behind me, I thought, "Now I can settle down and finish up the illustrations!" I have this illustration job that started late last year, and then with the gallbladder surgery, colon cancer, breast cancer issues of the past 8 months, everything with that has been put on hold. Until this week. After talking to Elise, the head of the Department of Religious Education for the Eastern Diocese of the Armenian Church, we decided that if the book (a childrens book about what goes on in Armenian Orthodox church from a child's perspective) is going to be ready in time for Christmas, then I need to have the illustrations done by the end of October. EEeeeeppps!!! That's only a month and some change away! For the past month, it seems that I have just had such a lack of energy. 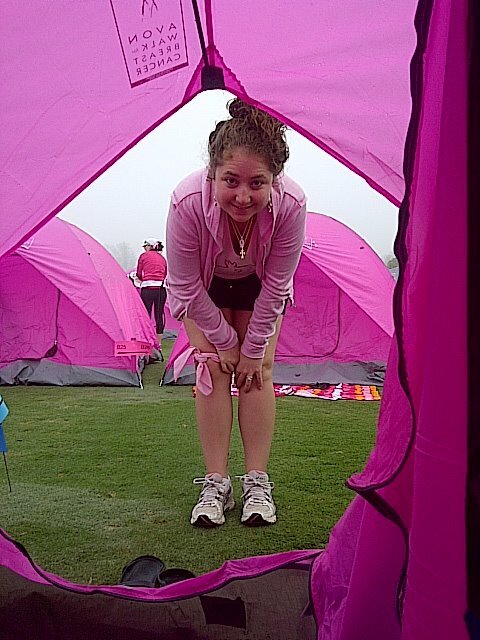 I mean, yes, we trained for the avon walk, miles and miles of training, and then the intensity of the weekend. But I mean, other than that. I've always been one to be "busy". My life is filled with projects, and burning the candle at both ends and in the middle too. Lately, though, it's been catching up to me, more so. I've had to come home from work and just "veg" out...laying down on my bed in the afternoon...sometimes even falling asleep. 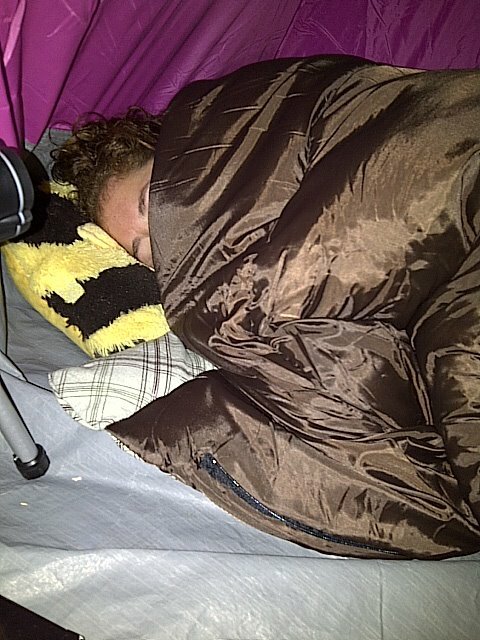 I've never ever been a napper. But it's okay. I am thankful that I'm able to do what I can do. I realize that my life has always been crazy. And that's not a bad thing. Like the comment I received a couple months ago, it just means I have a very FULL life. And this is good. Life is good. Soooo.....I am hopeful that I'll be able to get this illustration job done (prayers are appreciated). If I can get it done by the end of October...I won't have it looming over me when I have my surgery. There is a peace that I feel when I do get to sit and draw...and I get lost in time. It's just the effort of getting myself to sit and do it. Once I do, it's bliss. So today, in fact, right now, I'm going to sit down at my drawing table and work! 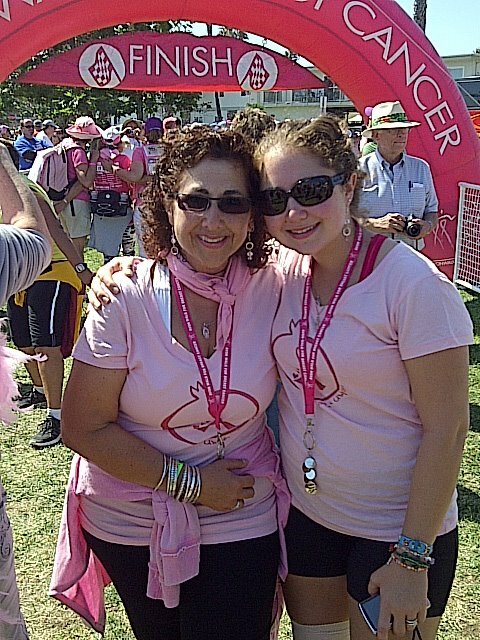 It hasn't been a week since we walked in the Avon Walk for Breast Cancer. And although I haven't thought about going for a walk yet, it seems that all I can think about is that feeling we all got by participating in the walk. The hope. The energy. The positivity of a collective of concerned people walking toward a common cause. As I told you all, the closing ceremonies were very emotional for me. 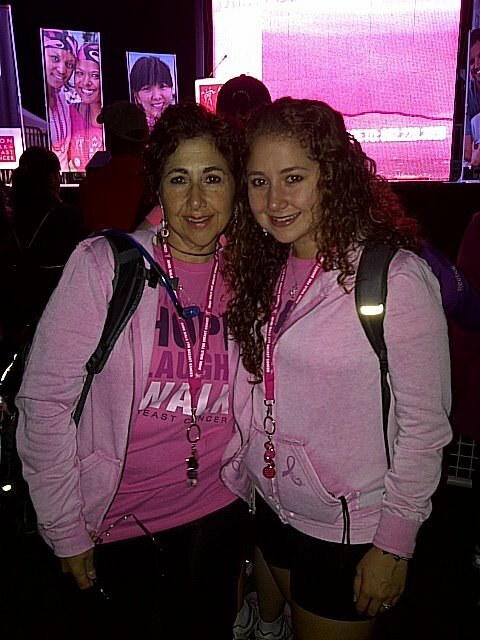 It was only 4 months ago that I was diagnosed with breast cancer, and there I was, at the closing ceremony, preparing to walk in with the 256 survivors who had participated that weekend in walking 39 miles! Some had been long-time survivors. Others had chemo coursing through their veins! Some were just starting their protocol...others were waiting for test results. We were all survivors. It was so empowering. I felt it. And my family and friends felt it too. 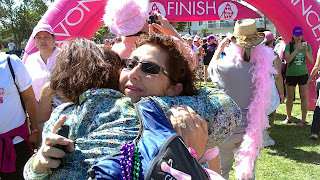 And it was right after the ceremony that we decided to walk in next year's Avon Walk - Santa Barbara 2012. As a team. 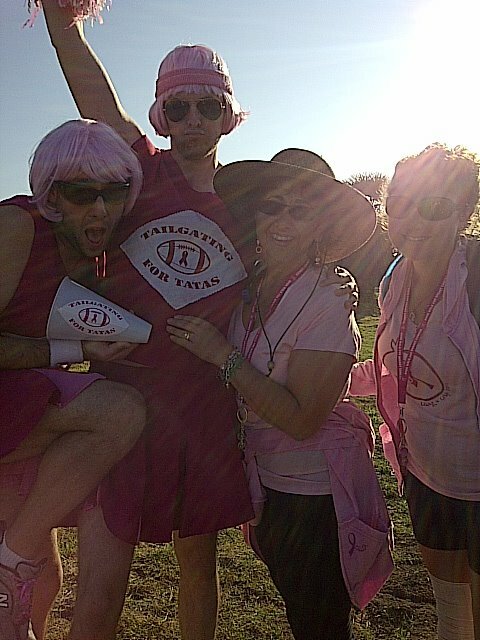 Team In Her Shoes. Seven of us signed up that very day! But I don't want to stop there. I know there are a lot of us out there who want to do it, but don't know if they can. Let me tell you -- You CAN!! Last night, I set up a Facebook page. And we are setting up a registration meeting/team meeting on Friday, October 28. I have some venue ideas, and I'll announce the location as soon as I have a definite location; but for now, please mark this date and join us. 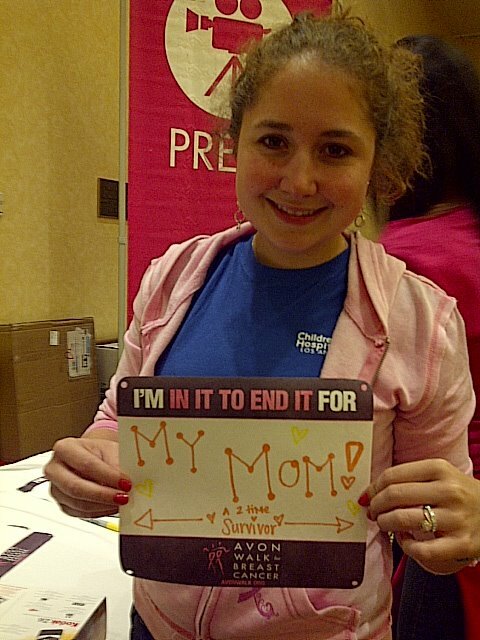 If you've ever thought about doing the Avon Walk, join us! Even if you feel like you're out of shape, but would like to "some day" be able to do it, join us! Maybe you're thinking, you'd like to, but the fundraising is daunting, join us! The fundraising commitment per person is $1800 plus registration. 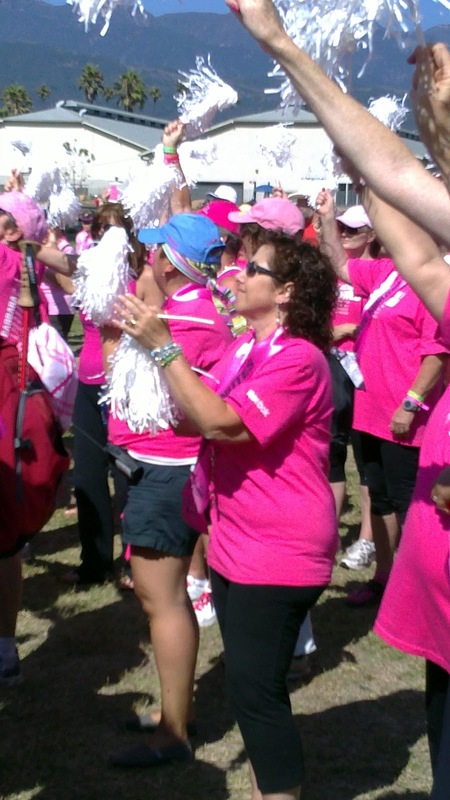 BUT, walking with Team In Her Shoes, we'll do it together. We'll train together (we have a year! 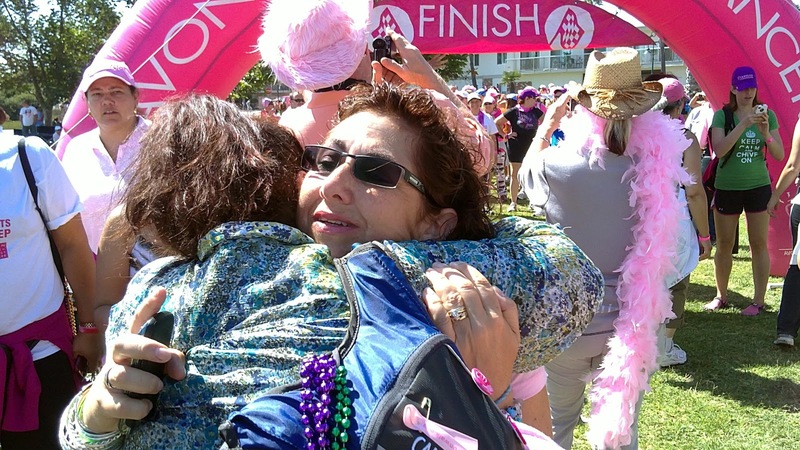 ), we'll work on fundraising strategies, we'll get in shape, and we'll work toward a common cause....bringing an end to Breast Cancer and walking In the Shoes of those who are battling cancer! What if you physically can't walk but you'd like to participate? We can use CREW members too! Crew members work the weekend of the walk at the rest stops, directing traffic, food service, security. We can have CREW In Her Shoes! Many more men walked this year with us....why not. Did you know men can get breast cancer too? Yep! So think about it! Men, Women, Daughters, Sons, Sisters, Brothers, Friends, Family. Let's get a big group together and DO THIS! Together we will have an amazing time. Together, we'll raise funds and awareness. Together every step of the way!! You'll get more information, watch video, hear about the walk, learn about training....and meet the 2012 team members (and hopefully sign up to join us!!) The more the merrier!! We're just starting up...and signing up! Please "LIKE" us on Facebook: "Team In Her Shoes"
I look forward to meeting all of you. Let's walk together to make a difference. Let's be the change we'd like to see in the world. None of us is as powerful as ALL OF US!! Opening Ceremony - 6:00 a.m. We're ready! Here are photos of our amazing weekend at the Avon Walk for Breast Cancer 2011. We walked 39.3 miles in two days. The photos are out of order, but I put captions. You'll get an idea of what it's like from them. Basically, it's set up so that Friday evening, you check in at Event Eve. Turn in any last checks you may have received, take photos, get pumped up. Day 2: Walk 13 miles (half marathon). Closing Ceremony. In between you make a lot of memories, feel the hope and love of those around you, and feel that you really can make a difference. Enjoy! 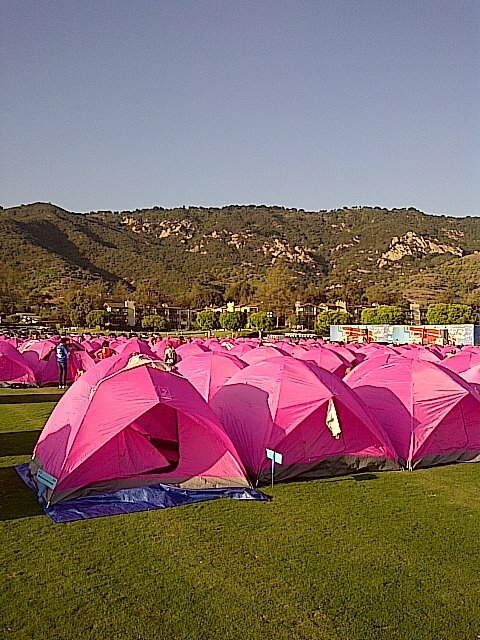 Getting started at 7:00 a.m. We were a sea of pink as far as the eye could see! Lunch stop at mile 10.6. 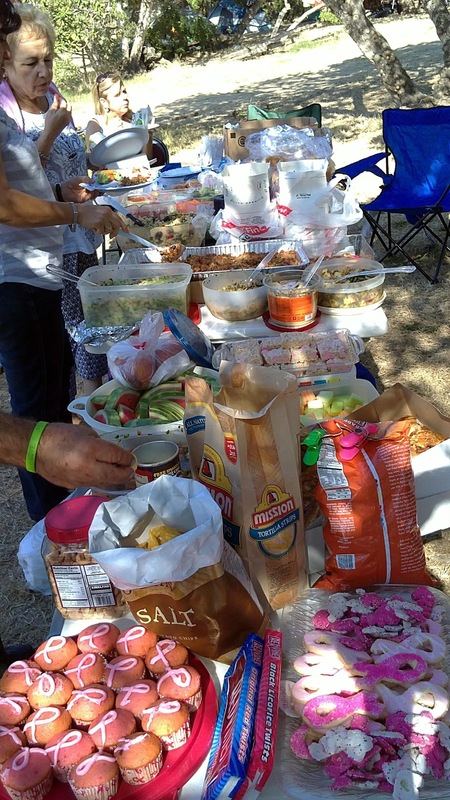 Sandwiches and a chance to sit! Last year's cheerleaders returned. Their wives were walking again this year! Ani at event eve, writing out her sign. I'm so blessed! Our packs with the names we carry with us. I'm a little slower in the morning than Ani. She's telling me to hurry and pack it up. We need to hit day two at 7:30 a.m.! Day 2 lunchtime. Assessing our wounds. 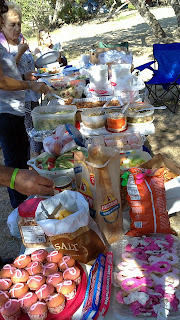 Amazing celebration potluck picnic from my family and friends! At closing ceremony with the other survivors! A hug from my baby sister!! We walked this weekend. And walked, and walked and walked some more. Went to bed in our sleeping bags stiff and sore, and got up and walked again...until we walked a total of 39.3 miles! We walked because we couldn't not walk. We walked for those who couldn't walk. 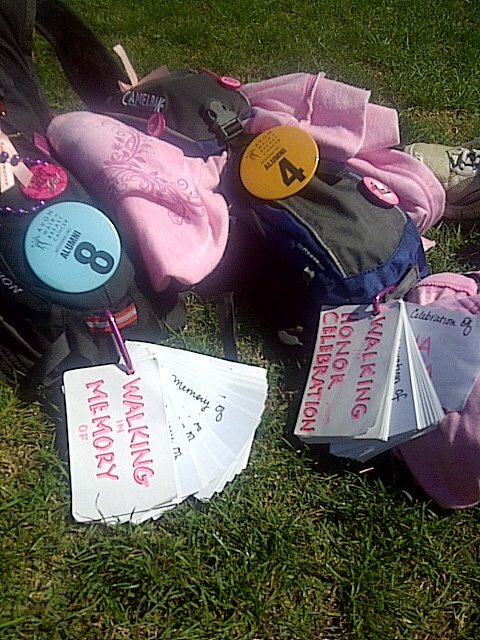 We walked for those who are battling cancer now, those who are survivors. And we walked in memory of those who have lost the battle. 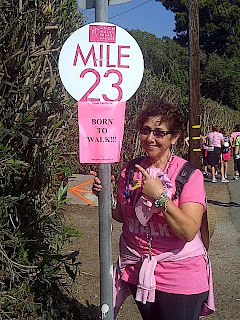 We walked for the poor...those who can't afford health care and mammograms. And together, we raised $4.6 million. It was emotional. And empowering. 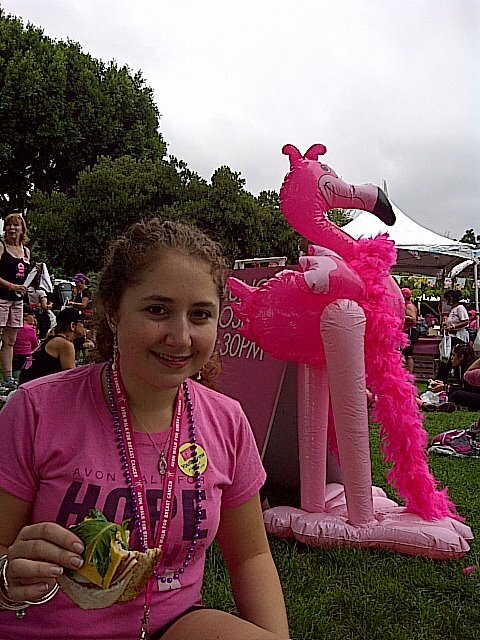 Just 4 months ago, I was diagnosed for a second time, with breast cancer. 18 years ago, when I received the first diagnosis, I thought someone had pulled the rug out from under me. I was 34, a mother of two. This time around, I knew I would make it. Sure, there's the initial fear, but I am so much stronger now. Back then, life was so uncertain. Now, I know that life IS uncertain and things can change from day to day. Life is fragile. But we deal with it. There are no guarantees. So we walk when we can. We try to make the difference. And we try to be the change that we want to see in the world. This was a milestone year. 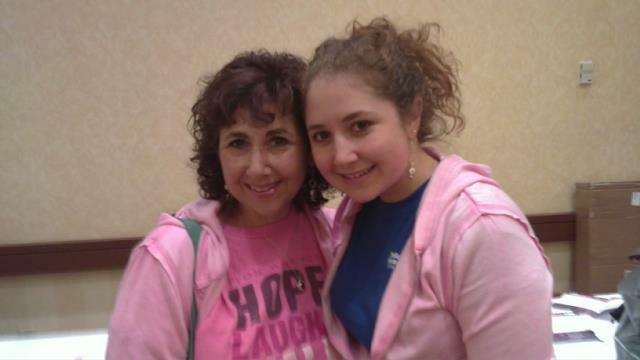 Colon cancer, breast cancer, Ani's graduation from nursing school. We had to walk. It was a celebration of life. Of being alive, of being WELL. Not only physically, but mentally. We made it through. All of us. Together. Holding each other up. One day at a time. The idea of the walk is to take your time. To learn the stories of those around you. To take it all in. Every walker has their style. Along the walk, you meet all kinds of walkers. Those that like to cheer. Those that need to talk every step of the way. The singers. Those that follow their group. There are those that need to be noticed, with outrageous costumes, and crazy wigs. And there are those that like to walk alone. Meditative and quiet. Ani and I are quiet walkers. We talk a bit, when there's something to talk about. We point out beauty around us - a pretty door, a beautiful flower, a perfect spider web. But we are just content to walk side by side in quiet. I love this. We were a sea of pink. Some 1,800 of us. Mostly women, but men as well. All walking to make a difference. To fill a void, to remember a mom or a sister, a wife. 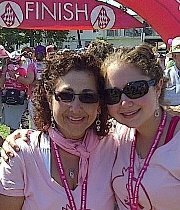 We walked near a man who was walking for his wife....she was a 10 year survivor. She had walked as much as she could that day and took the shuttle back to the wellness village. But he kept walking. For her. We walked with a woman named Phyllis for a while. She told me she was walking, "slow and steady...at my own pace." I didn't want to invade her space, but then she opened up. "Y'know...in the South, during civil rights times, we would have to walk. We didn't have cars...we'd walk everywhere. It makes me remember." The walking connects us. We are all walking as one. A pink sign reads, "None of us are as powerful as ALL of us." We are powerful. A sea of pink. There are hours that go by. That first day, we walked for 10 hours. I prayed while I walked. I was thankful for the day, for being well enough. Thankful for my family, my support system. Thankful for medical care. And thankful for those who walked in my shoes before I ever got diagnosed all those years back. For those that funded the research so that I can walk today. Yes, it was hard. After walking all those miles, you start to hurt. 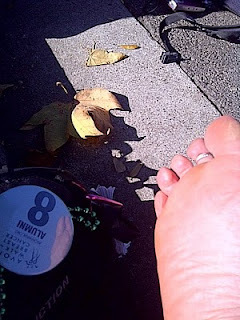 You know you have blisters, but you also know that if you take off your shoes, you'll never get them back on. So you walk through it. And pray. One foot in front of the other. And you remember. Like Phyllis, remembering the days of the past. I remembered my grandparents who were marched through the desert during the genocide and I called on their strength. I had a choice. They didn't. I could stop, but I didn't. We choose to walk. Because we can. Because we CAN'T not walk. It's the walk of Hope. Even My Car Is Ready! I have a friend who is homeless. He is wheel-chair bound, has only one leg, a long gray beard and soft green eyes that have a lot of kindness in them. Every weekday when I leave work, he is there on my way to the parking garage. He puts his cup out on the sidewalk and never asks passersby for money. Instead, he keeps track of who goes by and builds friendships. And because of this he is very approachable. Somedays I can put a dollar in the cup, other days it's just some loose change, or I'll hand him part of my lunch, but I will always stop and say hello and talk to him and ask how he's doing. And others do the same. Yesterday was not the greatest day at work. Yes, I got great news about the genetic test results, but my work day was tough, and as I approached my friend at the end of my day, I was in thought. I stopped to say hello and he asked how I was. I said, "Not every day can be a good one, but every day is a blessing." He thought about it and said, "That's very true. My grandma taught me that you should count your blessings every day." We talked a little, and he got excited like he suddenly thought of something. "Wait," he said, "I have something to make your day better!" He hopped up on his leg and started rummaging through various bags all attached to the back of his wheelchair. He said, "A lady gave me a bag of these and it's just the thing to make your day better." Finally he found it. He produced a small, bite-sized Milky Way candy. He gave it to me to improve my day. It was a small gesture from one friend to another...and then he gave me a hug. You know what? He was right! It made my day. : ) And I don't even know his name...but today, I'll ask. Just got the good news! I am NOT a carrier of the Breast Cancer gene! After a week of trying to get a hold of my doctor, she called today with the blood test results. "Your blood workup came back negative...and completely normal!" What a relief. As you can see, the ramifications of a positive test are many in nature. My main concern, of course, was the possibility of being a carrier and what this would mean for my daughter, my sister, my nieces. This is why it was/and IS so important to get tested if your doctor feels there's just cause. My father would say, "Knowledge is power." And I've always been one to want to know what's going on...especially within my body. Given my medical history of breast cancer at age 34, ovarian cyst (removed as precaution since I had cancer at a young age), gallbladder surgery, colon cancer and then breast cancer again, they doctors felt there was just cause. But this story has a happy ending! I'm not a carrier. And I'm breathing a sigh of relief....for my daughter, for my future grandchildren : ), for my family. Life is good! Yesterday, in training for next week's walk, Ani and I mapped our course and set out to "Walk to Lunch" at our favorite coffee shop in Glendale - Foxy's. We live in Sunland. 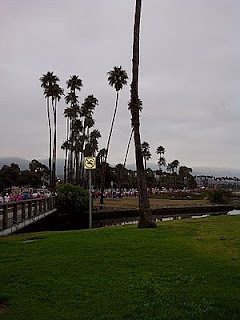 The route consisted of walking uphill about 3 miles (next week's walk touts 13 miles of hills), into La Cresenta, through Montrose and down into Glendale. One of the things about training for a walk is the hours of time it takes to prepare. Considering we're walking about 3.2 miles per hour, a 15 mile walk like this one consumes 5 hours of time. And Foxy's is 15.5 miles from our home. This to me is viewed as the downside. My Saturdays are my only "catch up" day...housework, shopping, cooking, cleaning. We started our journey around 8:00 a.m. Thankful for the overcast weather -- a nice change from the triple digits of last week. Walking with one's best friend is always pleasurable. When that best friend also happens to be your daughter, it's a double blessing. And while we walked, we talked about her new job, what's going on at my work, what I need to get done on an illustration job I'm working on, health issues, family issues. All of it. This is the beauty of walking. It allows you to talk. To have more than a 140 character conversation....it takes time. And while we were walking, I started thinking about how far I had come. I mentioned to Ani, "My surgery was only 4 months ago." Her response: "Yes. And you need to remember that!" So true. It seems like it's been a long time, yet, only 4 months ago, I underwent a mastectomy and reconstruction with a tram flap procedure. Not easy. And here I am, walking. I also thought about years past. I have always done the Avon Walks no matter what size I have been. I am doing it this year 72 pounds lighter than 2 years ago...about 15 pounds lighter than last year. And the difference in great. Less stress on my knees, less blisters while walking, less aches and pains, and the hills are not as difficult as they once were. I remember when I started on this weight loss journey almost two years ago. I had gone to see a nutritionist...and I had also gone to see a cardiologist who did some echo studies of my heart. I only lasted 9 minutes on the treadmill that day, and then I got to see my heart as it recovered from the stress. Seeing my heart there on the screen was an epiphany to me. And thinking about it today, I still get teary eyed. I was looking at this amazing organ in my body....beating, like it had beat for the past 50 years, every day, day in and day out, never stopping. And what had I done for it? Abused it. Neglected it. Ignored it. And yet it kept up. Beating. Giving me life. That was the beginning of the journey. After seeing my heart, I couldn't go back to my old ways and so huge lifestyle changes were made. Less food, more exercise, changing up the proteins vs. carbs. And I am healing inside as well. We were talking about that yesterday. People are nicer to you when you're thinner. But I think that I am a nicer person as well. I am not as judgmental. Which I think was a defense mechanism for my judgment on myself...and others' judgment of me. I have walked in the shoes of the obese and entered the medical category of "overweight" now. (Believe me..this was a big milestone for me.) I think what happens is that when we are down on ourselves the guilt and shame that we feel for the lack of discipline in our lives, turns outward and turns into criticism toward others who seem to have it under control. Today is 9/11. Everyday is a day of forgiveness in the life of a Christian. Today marks the 10th anniversary of a day that changed all our lives. I remember the months after that terrible day. We saw a more united America. There were flags flying, and the country banded together - an unstoppable force. As we "healed", those patriotic feelings dwindled, and now it feels as if the country is more divided than ever. In order to heal, we need to work from the inside out. We need to heal ourselves first -- abusing the system, neglecting our responsibilities, judging others. We heal from the inside out -- removing the log from our own eyes before seeing the speck in others. I have a lot of hope for this world and for our beautiful country. The lives that were lost on that tragic day will always be remembered. But in order to move on, we need to forgive. Forgive ourselves and others. Pray for our enemies. Pray not only for our country, but for the World which we are all a part of. I just heard a promo for a new podcast with Linda Zadoian called Compass, part of epostle.net's programming. And in this promo, Linda describes some of the different facets of her identity. This morning, while I was walking, I was thinking about who "I" am. What is important to me as far as my identity is concerned, and what is not. Here's a list. I'm a Christian. A woman, a mother, a sister, a daughter, an aunt, a cousin, a niece, a granddaughter (though my grandparents aren't around anymore. ) I am a step-mom. I am a wife, a friend, a confidente. I am a breast cancer survivor. I am a colon cancer survivor. I am just a survivor....of life and all it's bumps and messes. I am a shoulder to cry on. I am a hugger. I am a lover of mostly everyone. I am someone that sees good in others. I am an artist. I am a jewelry maker. I am creative and crafty. I am an illustrator, and a painter. A sketcher. A musician. I am a reader. And a thinker - though sometimes too much. I am an observer -- noticing the little details in my surroundings and in people. I am a gardener - though not always a successful one. Still, I am a gardener and a planter of seeds with a hope for sprouts and for a harvest. I am a cry-er at movies, and sappy commercials. And at things that break my heart...like hungry and abused children and homeless people, and genocide and war. I am caring and compassionate. I am a believer...in love, in goodness, in kindness, and good prevailing over evil. And in prayer. I am a fighter. I am strong. I am healthy (until I'm not...but for now, thank God, I am!) I am an optimist. I am fearless. And I am brave.